An adsorbed natural gas storage tank was simulated in this work, with the objective being to predict the filling time, the filling capacity and the storage efficiency. A high-capacity HKUST-1 type metal-organic framework was used as adsorbent. The time-dependent phenomenological model of the adsorbed natural gas storage tank was developed considering mass, momentum and energy transfers. The cylindrical tank was 1.09 m in length with a radius of 0.15 m, and was equipped with an inlet hole for gas inflow. 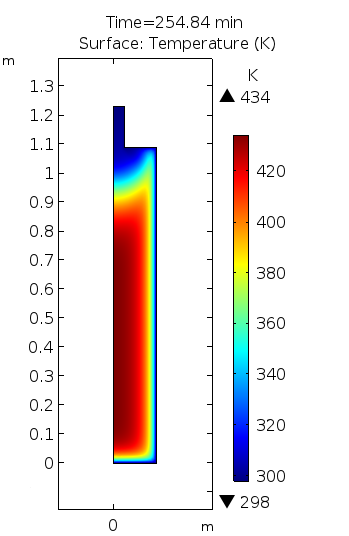 The simulation results show that the temperature increase in the tank due to adsorption heat is very significant. This affects the adsorption ability of the bed inside the tank, so the storage efficiency is consequently low. For the inlet gas flowrate of 50 L/min, the storage efficiency is 38% and increases to only 47% at 5 L/min. Corresponding filling capacities for the two flowrates are not very different, i.e. 89 V(STP)/V and 109 V(STP)/V. However, the difference in the filling times is extremely significant, which are 16 min at 50 L/min and 255 min at 5 L/min. One of currently emerging gas storage technologies is natural gas adsorption using porous adsorbents, known as adsorbed natural gas (ANG) (Vasiliev et al., 2000; Bastos-Neto et al., 2005). The technology requires no liquefaction or multistage compression processes. In ANG technology, natural gas is held in a porous material (adsorbent) at a pressure of 35 atm - 40 atm (Pupier et al., 2005). The energy density of ANG at 35 atm is proportional to that of CNG at 165 atm (Nie et al., 2016). The performance of ANG storage is affected by the nature of the microporous solid (Biloe et al., 2002; Lozano-Castelló et al., 2002a; Lozano-Castelló et al., 2002b), the adsorbent size (MacDonald & Quinn, 1998; Biloe et al., 2001a), the scale of the ANG storage tank (Chang & Talu, 1996; Biloe et al., 2001b), the natural gas composition (Seki & Sumie, 2001; Pupier et al., 2005), and the inlet flowrate (Sahoo et al., 2011; Alhamid et al., 2015). During the filling process of natural gas into a storage tank, the gas undergoes several process stages, each of which has a mass transfer resistance that decreases the storage capacity. In addition, the heat released during the adsorption process leads to an increase in the temperature inside the tank, thereby reducing the storage capacity. The U.S. Department of Energy has set the total uptake of ANG at 263 V(STP)/V. Experimental research has been conducted by Peng et al. (2013) to achieve the target using a HKUST-1 type metal-organic framework (MOF) adsorbent. At 65 atm and 298 K, the total methane uptake if the bed efficiency loss is ignored reaches 267 V(STP)/V, or equivalent to that of CNG at 255 atm. However, when this adsorbent is applied in a storage tank, the total methane uptake decreases due to the heat-released and mass transfer resistances. Therefore, the performance of the adsorbent in an ANG storage tank needs to be tested, either experimentally or through computer simulation, to discover the total methane uptake. Computer simulation is a fast and efficient way to determine the performance of a system (Muharam & Kurniawan, 2016). In the case of ANG storage tanks, it predicts filling characteristics such as storage capacity, storage efficiency and filling time, which are affected by temperature rises and mass transfer resistances in the tanks. Simulation of an ANG storage tank using Norit RGM1 activated carbon adsorbent has been performed by Sahoo et al. (2011). Their 2-dimensional axisymmetric model considers mass, energy and momentum transfers. The calculated natural gas storage capacity for the constant filling flowrate of 1 L/min and the filling time of 120 min is 72.5 V(STP)/V, while the value of the equilibrium storage capacity is 80.6 V(STP)/V. The maximum temperature increase achieved in the tank during filling is 27 K.
Simulation of an ANG storage tank using HKUST-1 type metal-organic framework adsorbent has not been carried out. Therefore, the objective of the present work is to predict the filling characteristics such as filling time, filling capacity and storage efficiency of an ANG storage tank, with HKUST-1 as adsorbent, through computer simulation. The high-capacity HKUST-1 type metal-organic framework was used as the adsorbent in the adsorbed natural gas storage tank in this simulation work. It loses efficiency by more than 50% during filling due to the high temperature increase. At an inlet gas flowrate of 50 L/min, the storage efficiency is 38% and increases to only 47% at 5 L/min. The filling capacities for the two flowrates are not very different. However, the difference in the filling times is very significant. We express our gratitude to the University of Indonesia, which funded this research through the Hibah Publikasi Internasional Terindeks untuk Tugas Akhir Mahasiswa (PITTA 2017) No 864/UN2.R3.1/HKP.05.00/2017 scheme.